The intricate details of the senior Hawaiian woman's wrinkled face are evident in this photo. 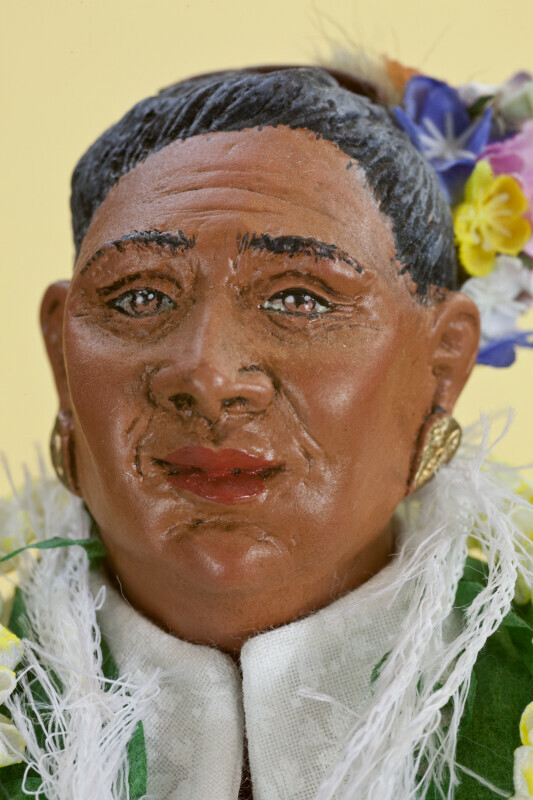 She is handcrafted from resin composition, and is part of the Island Traditions series of Patty Kanaar at Hei Mana Creations (1991). The tag says Patty was inspired in her designs by the cultures of the South Pacific. The figurine's greying hair is pulled back in a bun and held with a clip and a flower lei. She is wearing gold tone earrings, a flower lei and a feather lei. This figure stands 11 inches (28 cm) tall.